Not only are her daughters-in-law, Kate Middleton and Meghan Markle, redefining royal style with a modern perspective—but her niece Lady Kitty Spencer is now officially one to watch on many fashion lists. The 27-year-old daughter of Princess Diana’s brother, Charles Spencer, already has a signature look. However, if this is this the first you’re hearing of Kitty’s sartorial prowess, here’s what you need to know. She’s Dripping in Dolce & Gabbana: The lady is often wearing the Italian brand—not only because Kitty has a relationship with the fashion house (she’s walked its runways and was featured in a campaign), but the aristocrat has a penchant for intricate prints and patterns, traditionally feminine silhouettes and bold colors—things D&G excels at. The lady donned an all-white Dolce & Gabbana frock to the BVLGARI Dinner & Party at Stadio dei Marmi. Not only was the aristocrat’s printed Dolce & Gabbana dress a sight to behold, but her shoes made a statement on their own, too. 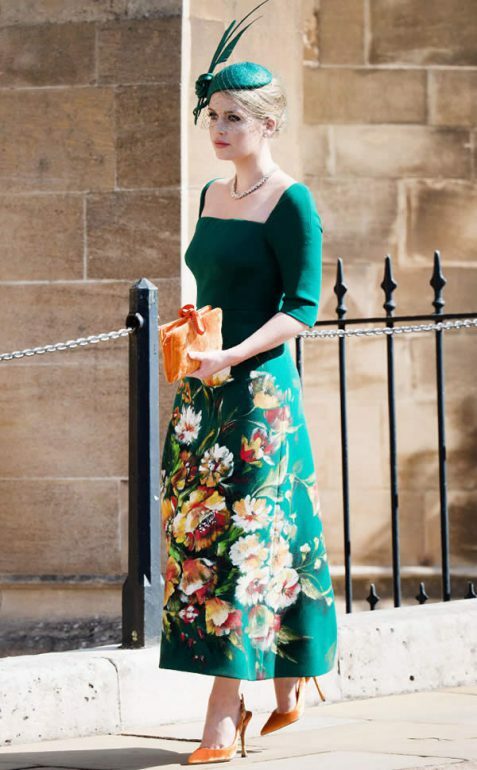 The floral applique on this Dolce & Gabbana dress perfectly blends in with the print, creating such a feast for the eyes. The collar on this Dolce & Gabbana dress say one thing; the waist says another. Somehow Prince Harry’s cousin makes the two motifs work! What does one wear to Meghan Markle and Prince Harry’s wedding? If you have exquisite taste like Kitty Spencer, something like this Dolce & Gabbana dress. While the black dress is lovely, the emerald-green Bvlgari necklace says it all. By now, you might have guessed Kitty loves her some Dolce & Gabbana, so of course she would attend the fashion house’s Secret & Diamond show during Milan Fashion Week Fall/Winter 2018/19 decked out in the brand. Princess Diana donned a velvet dress to a holiday dinner hosted by Polo Ralph Lauren. If a mermaid attended the 2017 Walpole British Luxury Awards, she probably would look like this.